Discussion in 'Transformers Feedback & Reviews' started by waffel, May 23, 2018. 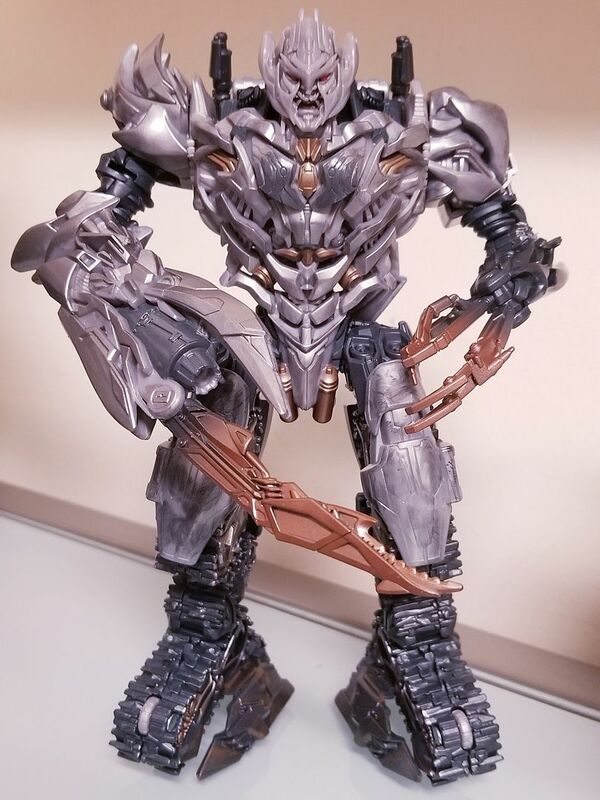 Yeah it's funny how this is probably the most widely repainted of all the studio series figures but I'm here with my completely unmodded grey hasbro one very happy with his colors. All the customs still look amazing but I just don't feel like it's worth it to me. Maybe someday... I did repaint Dragonstorm almost completely and that looked good. Allover silver is the easiest custom paint job. any exact measure of how tall is he? I don't have it, but it seems to be the exact same height as Siege Optimus, which is pretty much the exact same height as Classics Prime, so 17cm give or take 3mm. Ha, I'm an idiot. I thought I was in Siege Megatron. No, SS Megs is much taller than that. Sorry. Has anyone figured out a solution for preventing the thigh guards from popping out while transforming it? Could Mango Juice Todos saúdam Megatron! If I could make one sweeping change over the studio series line it would be to have more pinned pieces. Some of them feel super solid and some feel like they can fall apart at any moment. Megatron is super solid EXCEPT for those leg armor pieces, so it’s frustrating. The difference between SS01 bee and clunker bee is the perfect example of how this can make a huge difference. nail polish on the pegholes worked for me, as well as careful handling. Cannot get over the hollow bits....i would have paid $50 leader for this guy to NOT have a hollow chest and paint. Mine came without the one of the calf covers as well! I'm still very happy with this toy that I don't even know if the DoTM Leader is worth getting as well... Ehat u guys think? It's really down to what design you like. I generally like the dotm design better but overall maybe the voyager is a better figure for the price. There's also the target exclusive battle damaged one coming out too so just get whichever you think looks more cool!